You can create custom dashboards in the Mobile Analytics console to help you quickly and easily monitor the particular metrics and analytics that are most beneficial for measuring the performance of your app. You can have multiple custom dashboards, each of which can include up to four charts to display details of how users interact with your app. The charts are customizable, allowing you to include standard or custom data points as well as choose whether to use line chart, bar chart, or tabular presentation formats depending on the type of chart. You can try custom dashboards in a fully interactive demo mode. 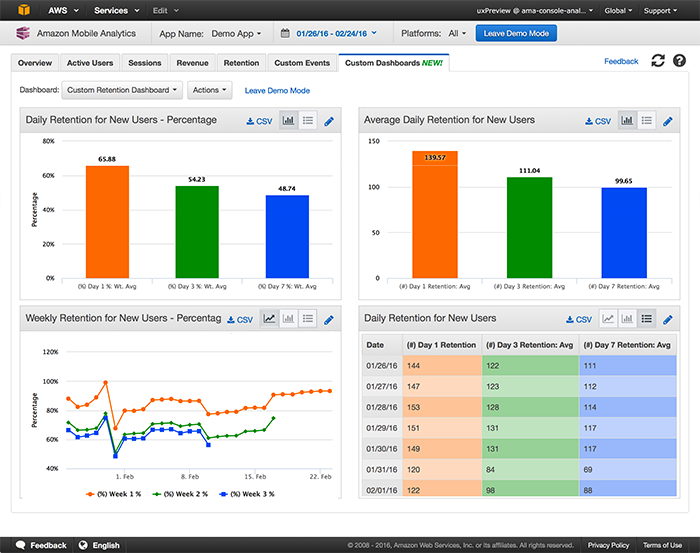 For more information, see Custom Dashboards Demo. Summary charts, which display their data per series aggregated over the displayed date range. Summary charts can be viewed either as a bar chart or in tabular format. Trended charts, which display their data per day over the displayed date range. Trended charts can be viewed as a trendline chart, a bar chart, or in tabular format.